The major pentatonic scale is often overlooked and misunderstood by guitar players. This is because most players learn the minor pentatonic scale first and assume that the pentatonic is always applied that way. In blues and rock genres, the minor pentatonic is often played over both minor and major chords which further adds to the confusion. By not understanding how the pentatonic can function in a major context, musicians miss out on half the sounds and styles that the pentatonic patterns can produce. This is usually not a problem with guitarists who have experience playing country songs because the major pentatonic scale is used a lot in country music. 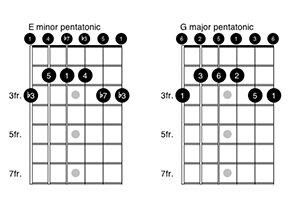 In the open position, pentatonic scale pattern one produces what most guitar players call the E minor pentatonic scale. It’s played over some type of E minor chord (or sometimes E major in a blues setting). The minor tonality is produced because the scale has a minor 3rd in it. The minor 3rd occurs between the primary pitch, E, and the note G. But the very same notes and pattern also make the G major pentatonic scale. All you have to do is play the scale over some type of G major chord. When the note G becomes the primary pitch in the music, then the B note in the scale becomes a major 3rd and produces a major tonality. In the neck diagrams above you see the same pentatonic scale pattern shown in its two forms, minor and major. You can use these notes to play over music that has either an E minor or G major tonality. In its minor form, the E note is counted as 1. In its major form, you count G as 1. So the first note in pentatonic scale pattern one is always your minor root and the second note is always your major root. This holds true for all keys. For example, E minor pentatonic is also G major pentatonic, F# minor pentatonic is also A major pentatonic, A minor pentatonic is also C major pentatonic, and so on. The tonality of the scale depends on which note is primary in the music. The songs listed below are just some of many examples that use the pentatonic scale in its major form. In all of them, the scale is played over major chords and the second note in pattern one is functioning as the tonic (primary pitch). “My Girl” by The Temptations is a great example of using the major pentatonic scale, as seen in the video above. Its opening guitar riff climbs right up the C major pentatonic scale. Later, the riff is transposed to F major as it follows the chord changes. This is just one of the many benefits to learning guitar theory and how music works. The better you understand the features and functions of your musical tools, the better you’ll develop as a guitar player. 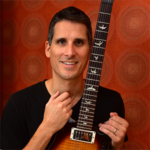 To learn more about using the pentatonic scale, see my video course, Pentatonic Scale Patterns: How to Easily Master the Patterns Used to Play Music’s Most Iconic Guitar Riffs and Solos. It’s also part of my full Fretboard Theory guitar theory program. thanks for all you do.your teaching style is the absolute best.even if it’s something I know or I have studied,you always have an amazing way of embellishing the curriculum. Not many people can explai as clearly as you and I’ve seen a few try!